Brigitte Reveili began her artistic career as a dancer in the Kilina Cremona contemporary dance company in France. The year 1989 was her first acquaintance with Indian culture through Kathakali which she studied in New Delhi and Kerala. She received an ICCR fellowship and has been performing both with the International Center for Kathakali in New Delhi and Kerala Kalamandalam for several years. As a teacher in the French Embassy school, she organized education programmes to introduce French students to Kathakali. 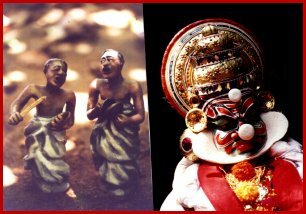 Her intimate knowledge of artistic language in Kathakali inspired her in transferring that world into terracotta sculptures. Combining her experience in the field of dance and sculpture, she is now working in the field of puppetry. She has also been participating in an Indo French production, The Opera “The Fakir of Benares” with her puppets in Mumbai and New Delhi. “Never For Ever”, a puppets, masks and an actors performance is an Alliance Francaise collaboration.